I'm Brittany Simonis, I'm 28 years old and I'm the HR/Office Manager for a Nutraceutical company in Sisters, OR. I started mountain biking in 2011. 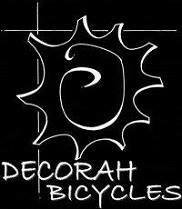 My then boyfriend, now finance' who owns & operates a local bike shop (Blazin Saddles) in our hometown got me hooked! I wasn't much of a cyclist when we met, but I saw how much he enjoyed it... and, let's just say I'm a tad competitive, so he showed me the ropes! 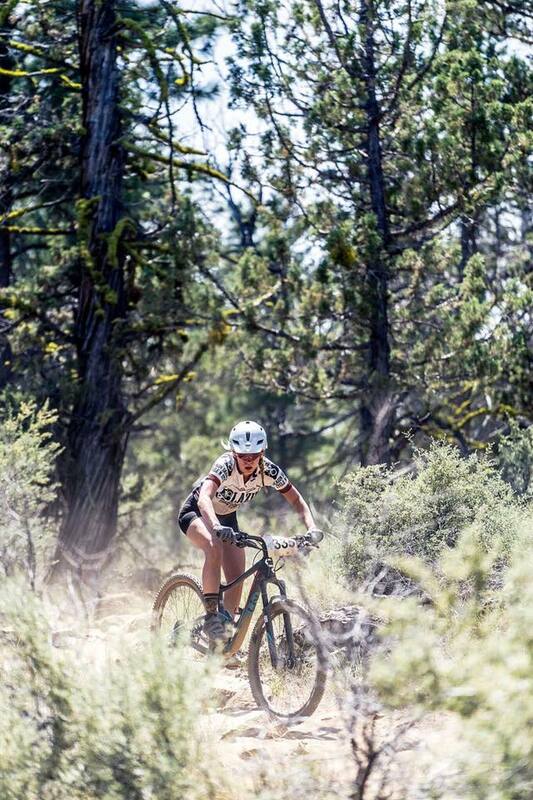 I was instantly hooked, and the next thing I knew, I was online looking at anything I could find that related to women & mountain biking. As you can expect, at the time I didn't find much... but what I did find was a free skill event hosted by Lindsey Voreis/Ladies AllRide. 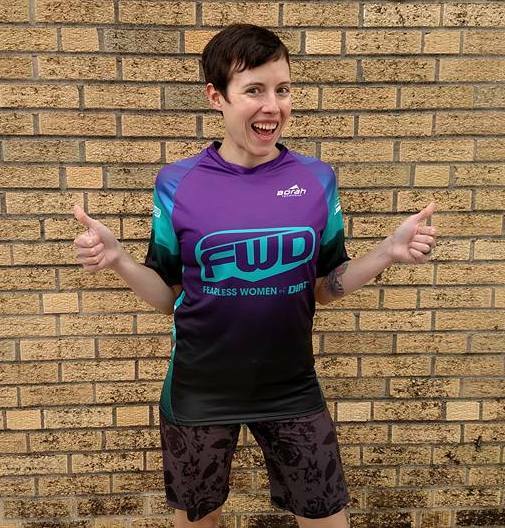 Although I'm competitive, I have a tendency to be very nervous- I was brand new to the sport, would I look like a fool? I put my nerves aside and attended the event, and again- I was even more hooked! I felt like skills were coming naturally, gained a new confidence and saw what it was doing to the ladies around me at the event. I remember getting home and rambling on and on and on about how amazing the event was, and how I amazing it would be to coach someday. A year down the road, I'm still riding my mountain bike as much as I can and holding onto this idea of coaching. 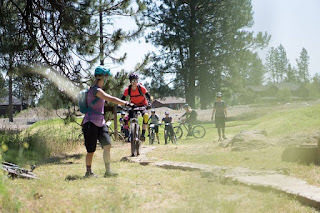 Casey (my fiance') and I are helping out at a local event and I see a couple of the coaches from the Ladies AllRide clinic- now I blame and thank mountain biking for giving me the confidence I had to do what I did next. I walked down to their tent and worked up the courage to ask if they might need any assistance at a future event, and that I'd love to not only dial in my skills but get involved with coaching. And, to my surprise, they were all about it! 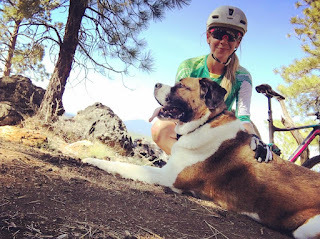 I started assisting with Ladies AllRide & Grit Clinics out of Bend, OR in 2013, and over the years have moved from assistance to co-coach to now a head coach! Additionally, I'm now in my 3rd year of being an ambassador for Liv Cycling USA where I host women's specific events year round, getting women stoked on bikes and more importantly finding a whole new kind of confidence for themselves! My then boyfriend, now fiancé owns a local bike shop in our home town; I wasn’t much of a cyclist when we first met. I enjoyed your typical cruiser ride around town- but had never been on a road bike and had only been mountain biking maybe twice back in high school. He took me out on a couple road rides, where I quickly found that being on the road with vehicles wasn’t necessarily my cup of tea. I noticed how much he loved mountain biking as well, so I thought why not give that a try!? I instantly loved it! Some would say I’m slightly competitive, so I enjoyed chasing him around the forest, riding new trails and gaining more confidence & skill. The more we went out, the more I fell in love with being on my mountain bike! My first few rides were on our local trail system in Sisters, OR- we are blessed here in Central Oregon to be surrounded by endless amounts of singletrack! I remember the rides being a combination of frustration and moments of pure joy. It was something completely new to me, and at times challenging. I HATED climbing… and my fiancé was good at it. I felt slow on the climbs and didn’t quite have the confidence to ride obstacles that seemed impossible to ride on a bike at the time. Thankfully he was patient and willing to give advice. Soon I started to realize that without the climb, there would be no downhill and that typically at the top of that climb there’s something amazing! I guess you could say it was the process that made me say YES! This is for me! The relationship it’s created, the confidence it gave me, and the places it takes me! Your fiancé is the one who introduced you to mountain biking- how did he make the introduction a positive one for you? He was patient. VERY patient! Whether the ride was short or long- he’d wait at intersections, give advice through new technical features, and most importantly he cheered me on when I felt “slow” I think a lot of us are worried about being “too slow” or the “slowest” and he always did a great job of reminding me that it’s not a race, we are here to enjoy the ride! The more I realized that, the less I was in my own head. Do you have any tips or suggestions that might be helpful for someone to consider when introducing their partner/loved one to mountain biking? Patience and communication are so important!! Make sure your partner knows what type of ride you’re getting into, how technical the trail is and how long of a ride you expect to go on. Communicate preferences- do you like to lead or follow? Can we stop at that rock I usually have to walk? Set some expectations, and don’t be afraid to encourage your partner to grind it out at their own pace at times. Most importantly, always remember that your both out there to have fun and do something you both love, together! Clips- It’s what I essentially started out on. Funny thing, I completely ignored the instruction of clipping one foot in and pushing off with the other. I clipped one in, then the other directly after and proceeded to fall over, ha! 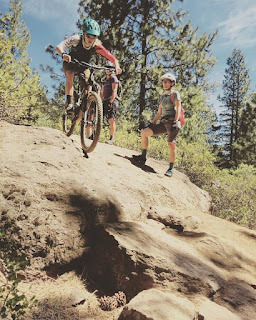 At first, it was a little intimidating, but I practiced unclipping and clipping back in over and over again on the flat section of trails until it felt natural. I still have plenty of awkward moments where I lose my footing and don’t get unclipped or clipped in, in time. It’s always a learning experience, especially when you’re already naturally clumsy! Most definitely! I’ve been fortunate enough to not have many major spills. The worst crash I had was about 2-3 years into my mountain biking journey. We had a couple pros in town filming a short series on trails in the area. It was an awesome day, but a long one! We spent the entire day riding and filming different sections of the trails (some of which I was unfamiliar with at the time). Towards the end of the day we were riding a fast, flowy section, with minor jumps here & there, very friendly and rollable. Unfortunately, I didn’t know the trail very well and speed was not my friend that day. I found myself not only crashing once, but twice. The 1st time, just some scrapes and a little blood. I could handle that! 2nd time, I found myself flying over the bars and smacking my head on the ground, cracked helmet & crooked bars! 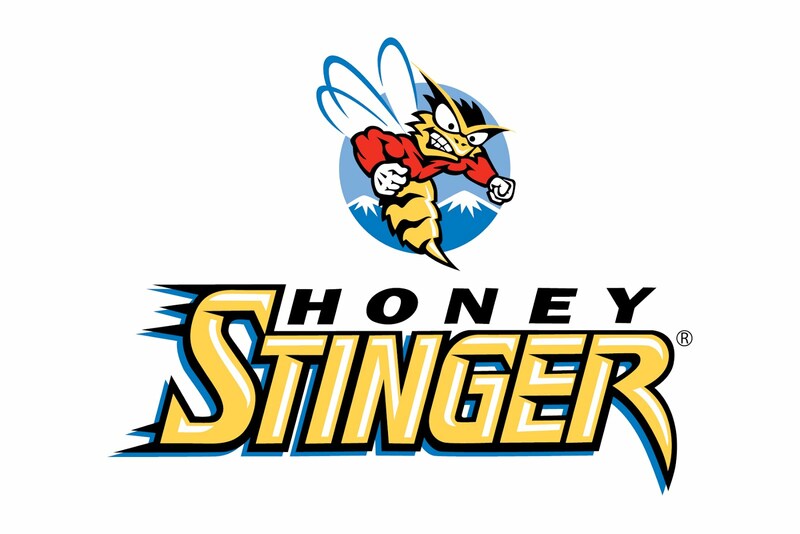 It was definitely nerve racking, and gave me this lingering feeling of fear that it would happen again. But, I knew I would get back on the bike soon- I loved it too much! Overtime, as weird as it sounds, I’ve learned how to crash and more importantly how to prevent myself from crashing. Most of my biffs come from my clumsiness. Standing, talking, one fit clipped in, awkwardly tumbling over. Always makes for a good laugh! Climbing! As I already mentioned, climbing was my least favorite. Not only because I felt slow and like my lungs were about to explode, but also cause I felt like my body was always in the wrong place. My front tire would come up or my back would be sliding out, or I’d get hung up on some stupid rock. Then, I would have to get off my bike and push it…which is my 2nd least favorite. I should be riding this thing, not pushing it! Over time I learned that you just need to shift your weight forward or back, and most of the time it’s just micro movements. You can also use stumps or rocks to give yourself a little push if you happen to get stopped on a climb. Or, find some ground that might be more level to start on. It takes some failing to figure it out! Definitely cornering. One side feels better than the other; some days are good and some are really bad. It can be frustrating at times, especially on new trails when you just can’t find a rhythm. I’ve found getting frustrated only causes more mistakes when I’m riding. So I try to just focus on practicing, enjoying the moment, and knowing that each ride is always going to be different. I love riding my bike because it gives me clarity, confidence, friendship and a rad relationship! When I’m on my bike I feel empowered, it gives me the motivation to achieve my goals. I currently ride a Liv Pique Advanced 0- it’s an aggressive, full suspension XC mountain bike. It has 120mm travel in the rear and 130mm of travel in the front. I LOVE my bike! It makes those not so enjoyable climbs seem like a breeze, and I can maneuver downhill terrain with plenty of confidence! I also have a Felt Café cruiser that I commute to work on, run errands around town and just enjoy a little ride whenever’s possible! It’s got skinny little road tires, panniers, and a cup holder… it’s made to do it all! 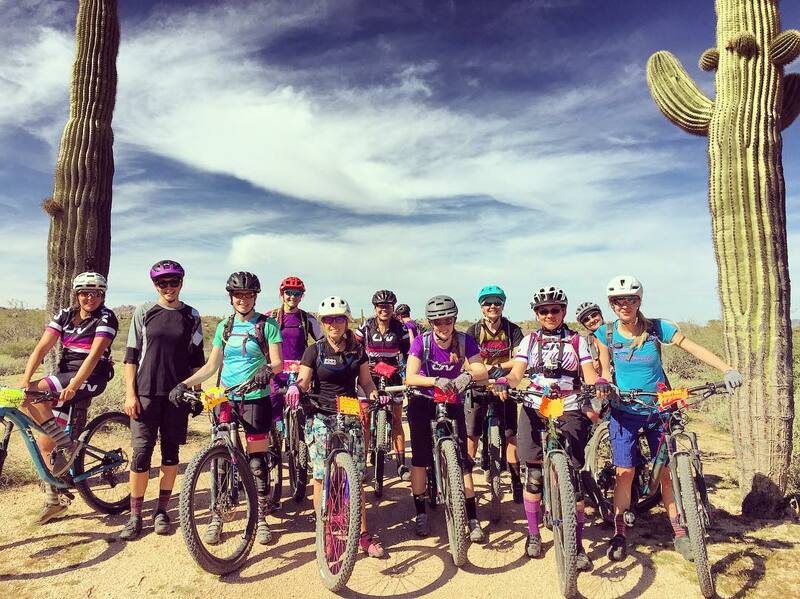 Tell us about your experience with Ladies AllRide, why was taking a skills clinic a great thing for you when you were a new rider? 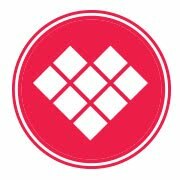 My experience with Ladies AllRide was absolutely AMAZING! Honestly, I was terrified at first- driving into Bend solo with this two wheeled thing that I’d just recently fell in love with. I remember pulling into the parking lot of Seventh Mtn. Resort and seeing the group of ladies and thinking…maybe they didn’t see me or this bike on my car. Maybe I can leave?? But, I stayed- and if I wouldn’t have stayed I wouldn’t know a third of the women I do now! The clinic was a smaller private that was being hosted by a local bike shop I believe. We went over the basics- body positioning, braking, level pedals, etc. More and more I felt my confidence growing. We’d all cheer each other on through different skills, and felt empowered to try something that may have intimidated us. It was an environment where we were all on similar pages and felt confident to ask questions. The clinic was great for me because it gave me an opportunity to breakdown & dial in so many basic skills in a comfortable environment. What do you enjoy most about being a head coach for Ladies AllRide? Ooo that’s a tough one, there are so many things I enjoy! The environment is everything- having 100+ ladies on mountain bikes, cheering each other on is truly something spectacular. There’s this energy all weekend of pure joy, a little fear here and there, and then by the end of the weekend, it’s like there are all these new women with this burst of confidence. 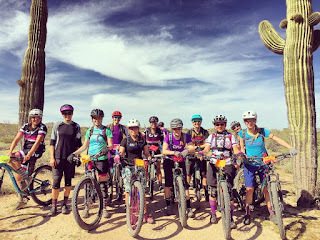 What would you love for folks to know about the Ladies AllRide grit clinics? That we are all about empowering each other to be the best we can, whether it’s on or off the bike. 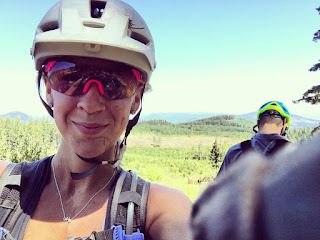 It’s not just skill building- although I can promise you that you will leave feeling accomplished, full of dialed in skill, and beyond confident on your MTB! What has been your best coaching moment during a Ladies AllRide clinic? I’ve been a Liv Ambassador for 3 years now, and honestly, it’s changed my life in so many amazing ways. It wasn’t anything I ever thought I’d be doing, but I stumbled upon the program on the Liv website and something inside me said go for it! The Liv Ambassador program has given me an opportunity to grow cycling in my community, to empower women to face fears and enjoy the sport of cycling without feeling too intimidated. I mean who wouldn’t be stoked on being in charge of hosting events with a bunch of rad women!? I love it because it’s honestly the reason I have and know 90% of the amazing women that I get to call friends. Being a Liv Ambassador has become a huge part of my identity, Liv is my family and I don’t know where I would be without the amazing support of this program! Why are ambassador programs, like the Liv program, important for women and cycling? These programs are so important because they not only open an avenue for women to become active in their community; it promotes a space & platform for more female role models. 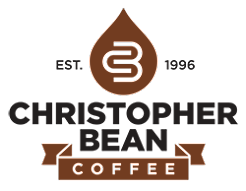 Ambassador programs have a positive effect on the ambassador themselves, and the retailer selling that brand as well- it’s an effective way to engage and develop a fan base in an empowering way! I think women feel intimidated when it comes to cycling/mountain biking, whether it be the industry in general or just jumping on a bike. The majority of shops lack an environment that is inviting to the female demographic, they would rather sell a bike they like then ask the proper questions to see what it is the rider is looking for. The times are changing though, and it’s awesome to see a change in trends. There are definitely way more options for women and way more women on mountain bikes!! I think the industry is already seeing a bit of change due to ambassador programs, group rides, and clinics. We definitely have more options than we ever did, but there’s always room to grow. As long as we continue to empower women to step outside their comfort zone, ask questions and feel more confident; the more involved they will continue to be. The more local shops get involved and host events & rides within their community the more we will start to see a change. My personal experiences on a bike are what initially inspired me to share the sport with women in my community. Soon though, those ladies became my inspiration! 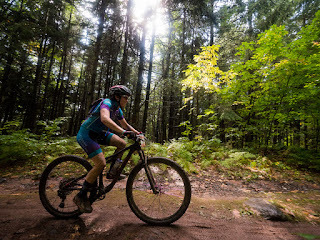 Seeing women of all ages experience the same positive, confident boosting effects on their bikes is the absolute best! It’s all about being the best possible version of yourself, whether it’s on or off the bike! I have a minor plant obsession! My fiancé calls me the ‘crazy plant lady’ ha! When we go on vacations rather than a souvenir, I bring a little plant home. We have plants all over the house… slowly working my way towards that mini jungle!